Fuelled by creativity and curiosity, Kim’s discerning eye observes the world as a camera lens. She captures the extraordinary in the everyday, and she transfers this unique talent into successful design solutions for her clients. One of the most talented creative directors in the business, Kim has been with Shikatani Lacroix Design since its inception. She has played an integral role in developing and shaping the creative direction of the company, and exhibits the same sharp focus and creative enthusiasm she did when she began her career more than 20 years ago. Her passion for design has translated into stunning results for our clients over the years. Her eye-catching designs contribute to the company’s commitment to the Blink Factor, capturing consumers’ attention and allowing brands to win at the moment of purchase. Kim leads a diverse and talented team of senior designers. 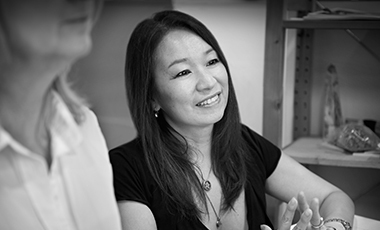 She works closely with her team to craft insightful design solutions rooted in strategic design thinking. A snapshot of her lengthy client list includes Tetley, TD Bank Group, Kruger Products, Melitta, Second Cup and PepsiCo Canada.